AirportWatch | Blog by John Stewart: Can a Four Runway Heathrow Really be Quieter? Blog by John Stewart: Can a Four Runway Heathrow Really be Quieter? In an interesting and detailed blog, John Stewart (Chair of HACAN) sets out what the effect will be of having a 4 runway Heathrow, as proposed by the Policy Exchange last year. Their plan is for 4 runways parallel, some 3.9 kilometres further west than the current runways, all of which could work at once. And they claim this will cause less aircraft noise for Londoners. John assesses this claim, and finds that the plan envisages up to 960,000 planes per year (cf. 480,000 now) and there would be no rest periods for Londoners during the day. Though the plan is for there to be no night flights, and for smaller planes to come in to land over London at higher altitudes due to a steeper glideslope, there is not likely to be an improvement in the noise experienced. Though smaller planes may be able to come in at a 5 degree glideslope, the noisier planes will have to continue on a 3 degree approach. What thousands of Londoners want is runway alternation and respite periods. They will not get these from the Policy Exchange proposal. Can a Four Runway Heathrow Really be Quieter? 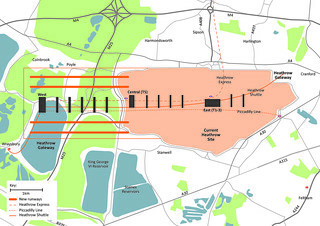 When the Policy Exchange published a report (1) at the end of last year calling for a new four runway airport to be built a few miles west of the existing Heathrow, it wasn’t taken too seriously. It was seen as just another report coming up with yet another idea for a new airport. However, it has emerged in the last few weeks that the Department for Transport – and possibly also the Airports Commission, under Sir Howard Davies – is beginning to take it seriously. It is a big claim. And the part that seems particularly to interest the authorities is its claim that the new airport will “significantly reduce noise over West London.” They believe that noise is the biggest barrier to Heathrow expansion. A view shared by Heathrow Airport (formerly BAA) though they have not endorsed the report and indeed they argue that only one more runway is required. The two outer runways would be for landings. The two inner runways for take-offs. The most northerly runway would be level with the current northern runway, with the most southerly approximately 300, south of the current southern runway. All runways would operate at the same time throughout the day. “The airport would have twice the capacity of the current Heathrow, implying a maximum of around 960,000 movements and 140m passengers [but] a sensible working maximum would be 850,000 movements and 121m passengers”. There would be three terminal buildings, situated between the two pairs of runways: Terminal 5, Terminals 1,2 and3, and a new terminal replacing Terminal 4.There are plans to improve public transport to the new airport. What about the claim that noise levels will be reduced? There would be no night flights. A steeper descent approach would be introduced for the smaller planes using the airport but that would not be possible for the larger planes. The very fact that the runways would be 3.9km west of the existing airport means that the planes would be higher over West London. The plan would be to land the smaller planes on the northern runway for one week and switch to the southern runway for the next week. What of people west of the airport? “Since wide-bodied planes will land on their current angle of descent, but land 3km further west, they will be lower above any given place on their descent. Against that, the noisiest planes have been eliminated, so the effect on the total noise is ambiguous. More planes will be noticeable, but fewer planes will be exceptionally loud…. the position is different for narrow bodied planes since they will be descending at a steeper angle. Individual planes over many areas would be quieter. There are, however, three very big ‘buts’. The total number of planes would rise to at least 850,000 a year, and maybe even close to 960,000 – up from around 480,000 at present. That is at least another 1,000 planes a day using the airport. It would be all-day flying. There would be no break from the constant noise. There is nothing in the proposals about the impact on areas further from Heathrow. Presumably the report assumes that the higher, quieter planes would not pose a problem. But what many of these areas would face would be constant all-day flying. The demand from people further from the airport for respite periods. None of these are addressed in this Policy Exchange Report. For all its interesting ideas for cutting noise, London and much of the Home Counties would remain under a sky of sound. Posted: Thursday, April 11th, 2013. Filed in News about Airports, Noise News, Recent News.